This blog continues to be several weeks behind the onsite reality, but the onsite reality is several months behind the very unreal schedule so I suppose that's only fitting. 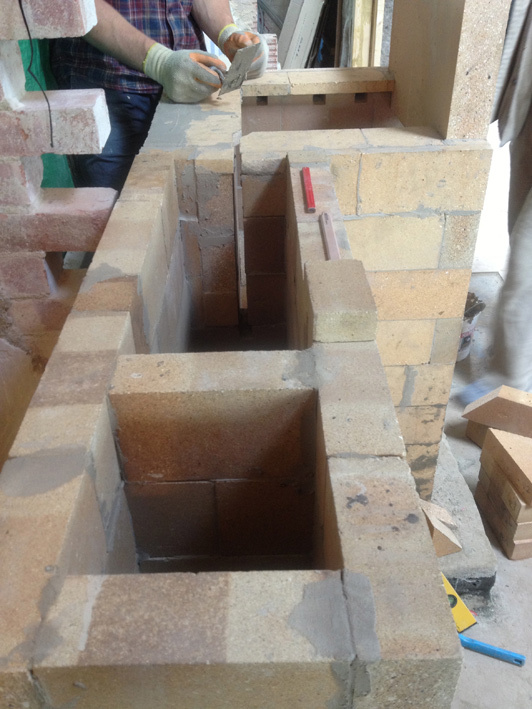 We've now built the big masonry stove (pictures below) that I'm so looking forward to cosying up to during any properly cold snaps. 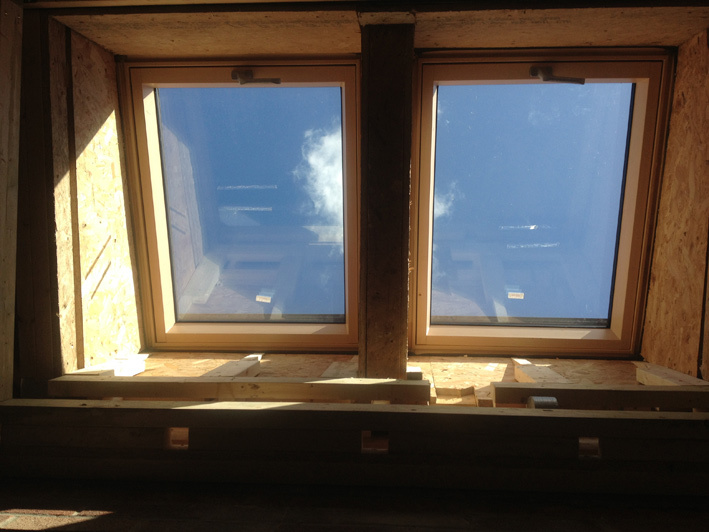 The main idea is to not need to heat the building very much, thanks to thick insulation and airtight construction. But sometimes in winter some extra heat will be needed. 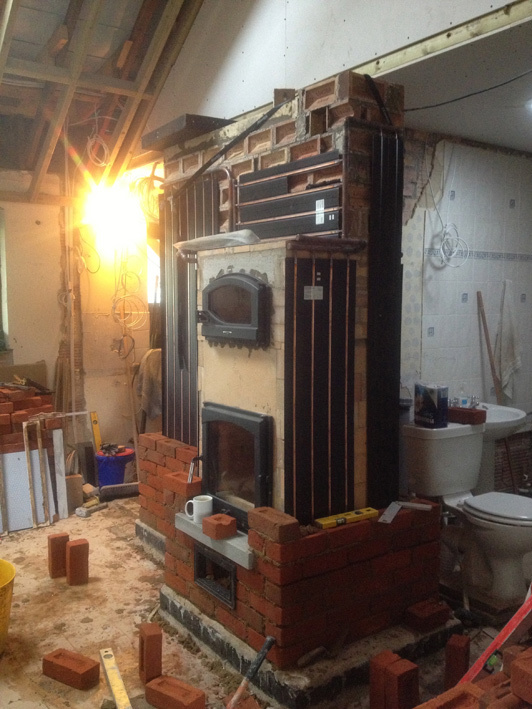 The standard way of heating with wood in Britain is a metal stove or an open fire. Even the good ones get dangerously hot while lit, create a stifling atmosphere, are starved of oxygen to make them burn slowly (in order to provide constant heat, but also ensuring a very inefficient, smoky and polluting burn) and don't store much heat. Once the fire's out there is some residual heat but most of it is gone fairly swiftly. 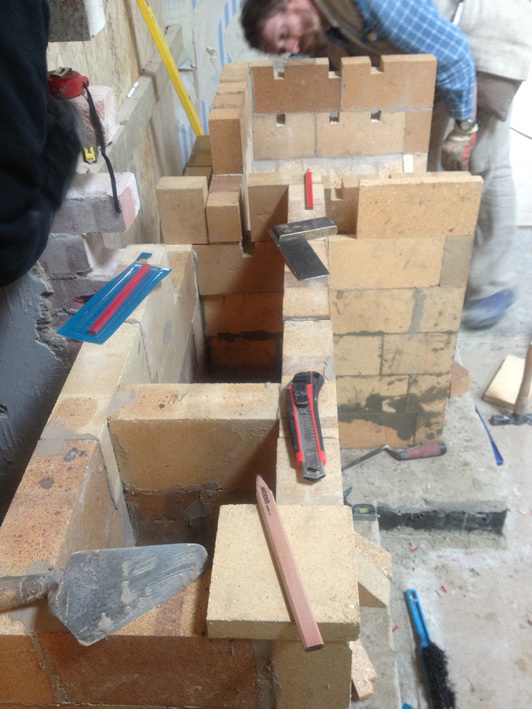 Masonry stoves solve all of this. There are various versions from different countries (Germany and anywhere East and North of it, really) and they've been around for a long time. The designs have been tweaked over time, especially with improved means of testing the efficiency of combustion and the level of emissions produced. 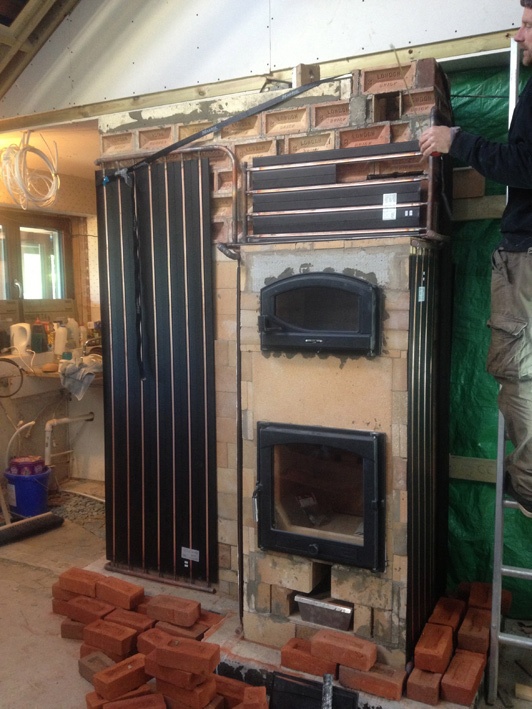 All are very clean-burning, producing the maximum amount of heat per amount of wood burned, with very low emissions (testing has shown them to have combustion efficiency of around 95% - on a par with modern and complicated log gasification boilers). The wood in a masonry stove is burned relatively quickly over 1 to 2 hours), with enough oxygen to ensure a clean burn. 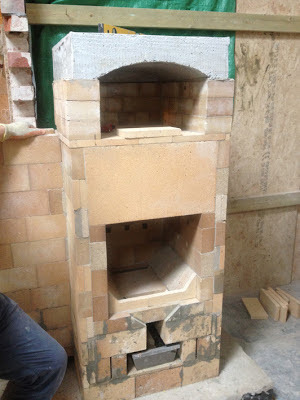 A secondary combustion chamber burns off the gases that burning wood releases, generating more heat and reducing harmful smoke emissions (it also doubles after firing as a bake or pizza oven, and looks amazing through the glass door during firing). 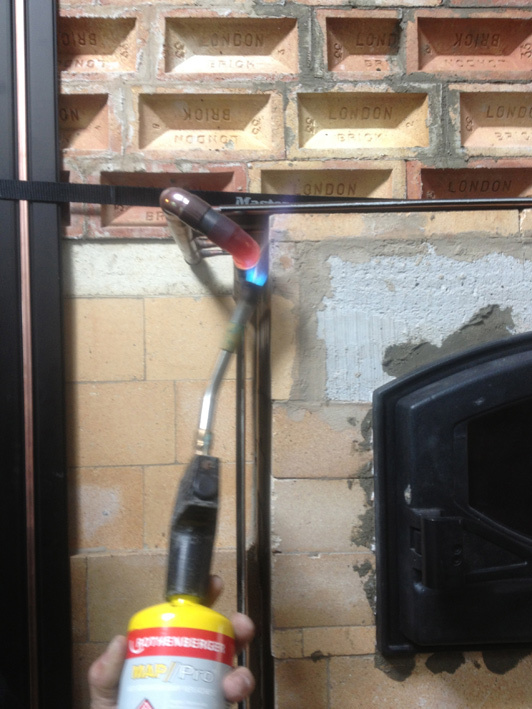 There should be no visible smoke from a masonry stove. 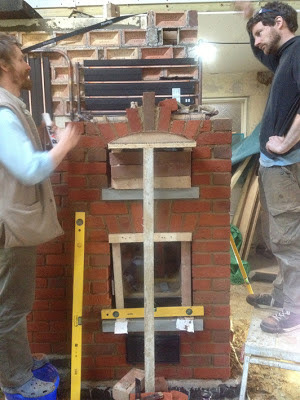 The flue-gases are taken for a wander around the stove, to make sure as much heat as possible is extracted from them before they exit via the chimney. 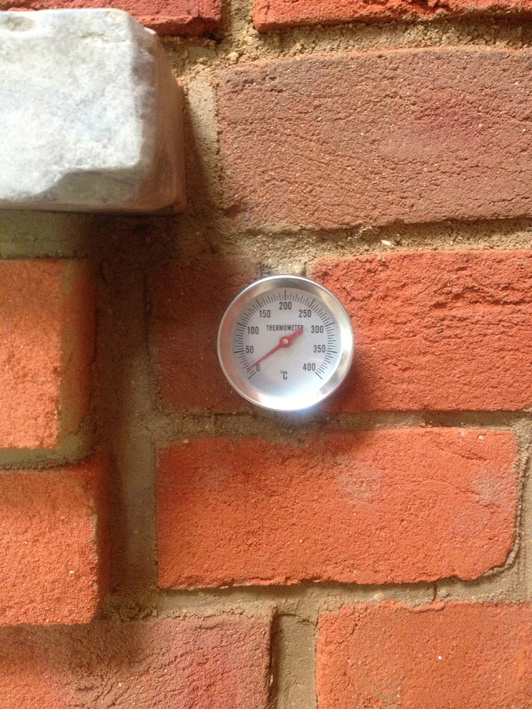 The bricks store that heat, slowly and evenly releasing it over the next 12-24 hours, depending on the type and size of stove, and how well insulated your home is. These lovely brick stoves never get too hot to touch so are great for cosying up to, much more pleasant to be around than the searing heat of a metal wood-burner. Ours will also heat water, toppping up temperature in the tank during the times when the hot-water solar-panels won't be so productive. There's much more info at www.stovemason.com, or on the specific type of stove we now have, at www.stovemason.com/double-bell-heater/. 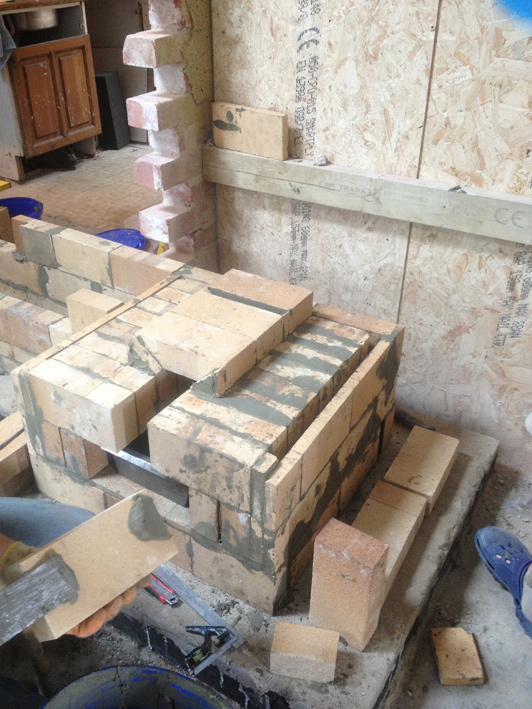 The stove was built by a team of four headed by Martin Ruzicka, reduced to two later in the week, at which point I joined in with the brick-laying. I also cleaned up and cut the reclaimed York sandstone (previously part of some London pavements) which forms the shelves and oven top. 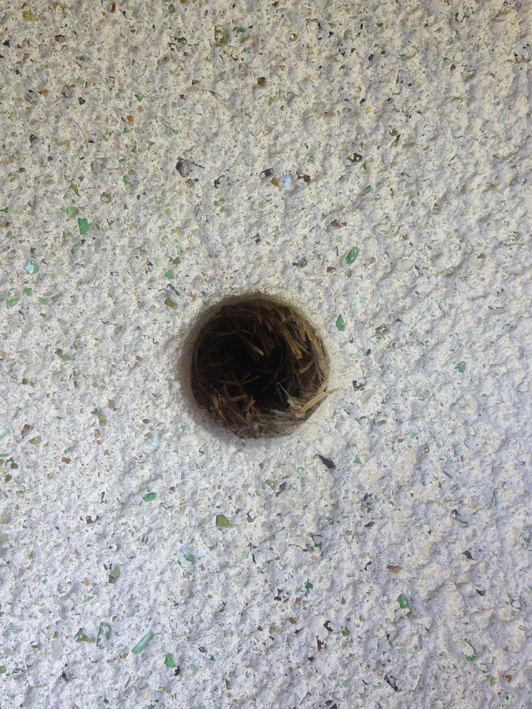 I discovered that ancient chewing gum somehow still releases a minty smell when you sand it - I don't know what that stuff is made of but it's indestructible. The bricks the stove is faced with are a slight indulgence in some ways - they are new, so represent a fairly high embodied energy from the fuel used to fire them - but they are local. The bricks are from Swanage brickworks, which is about 40 miles away. They're lovely and the same price as - or cheaper than - similar bricks from factories many many miles away; so of course none of the local suppliers stock them, stocking instead the ones from many many miles away. This is just one example of a messed up retail supply chain, so I'll try and avoid that particular rant here. The stove builders and me were besotted with the bricks, despite their slight awkwardness to use (being handmade there are a fair few banana bricks). It was lovely hanging out with a bunch of friendly people who shared my enthusiasm for nice bricks and fire, and my obsession with finding more efficient ways of burning wood. 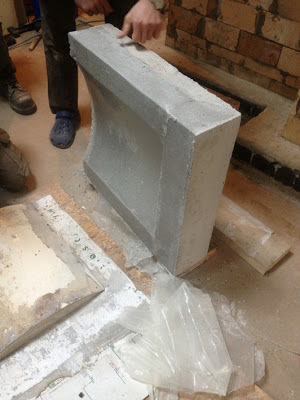 We had geeky conversations comparing technical specifications of different bricks. It was great! At some point I want to write about how wood fuel isn't necessarily so great after-all (a lot depends on where the wood comes from, and what you do with it, for example), but for now lets pretend it's a straightforward renewable fuel.. Anyway, here's the bit with the pictures. Building regs compliant airvent cover, providing the stove with its own dedicated, permanently-open air-supply. Ideally this would be closable, so that cold air doesn't enter the stove once it's fired and closed down. Ah well. Checking brick layout. 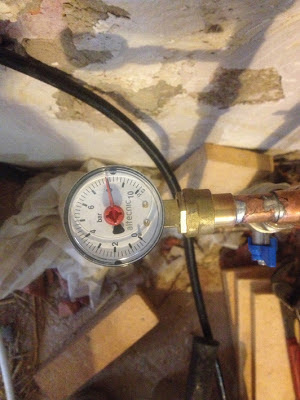 Some clear and accurate measuring at this point would have ensured the near end of the stove was in the right place. Apparently what I actually did was some confused and inaccurate measuring - the stove is now a little closer the outside wall (behind camera viewpoint), causing the planned doorway there to be a bit restricted. Again: ah well. Hot-water heat-absorber positioning. 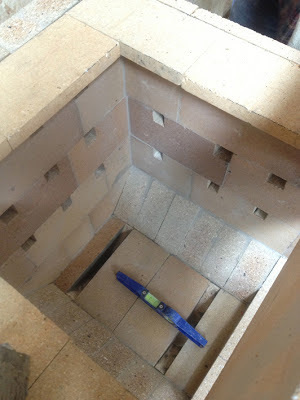 Stove base built around air-supply, so air is channelled under the ash-pit floor and up around the sides of the firebox. Oven/secondary combustion chamber roof, made from refractory castable mix. Oven roof being lifted into place. Ta-da! From bottom up: ashpit, firebox, secondary combustion chamber (a.k.a oven). The opening from firebox to oven is a restricted "throat" - this pressurises the gases released from the burning wood. As the gases enter the oven they expand and mix with oxygen causing a very effective second stage of burning, resulting in a very effiecient overall burn and very low emissions from the stove. 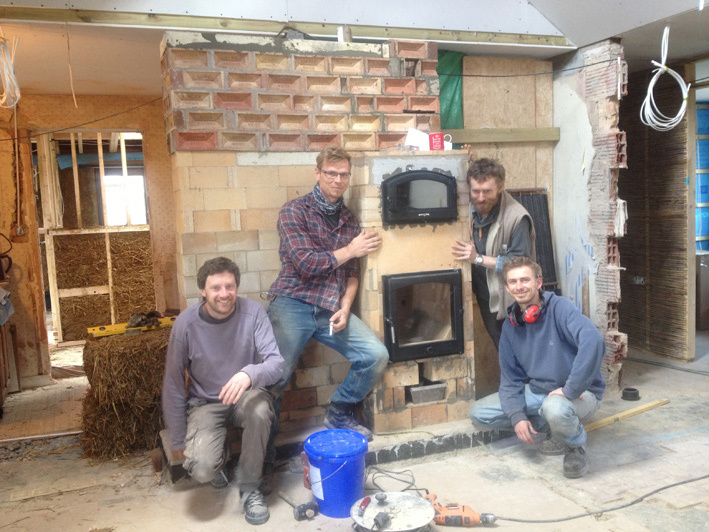 The stove masons with the finished refractory core. Braze-welding the heat-absorber plumbing (braze welding is sort of a higher-temperature form of soldering - it won't melt inside the stove like standard solder would, and can also take higher pressures). 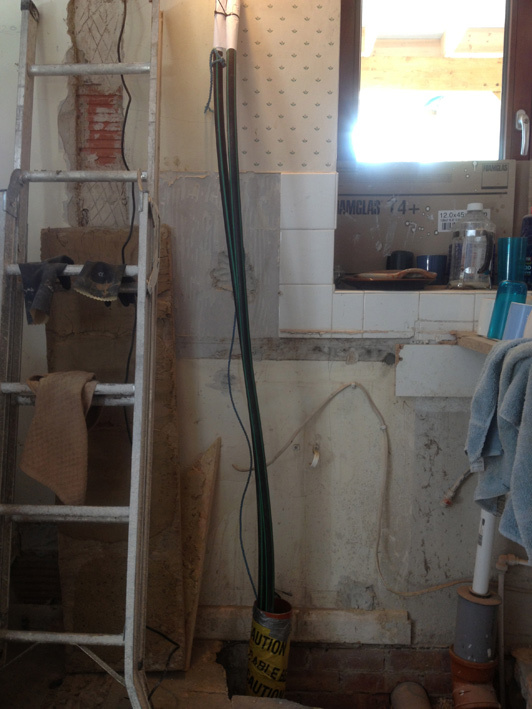 All the hot-water heat-absorbers joined together. 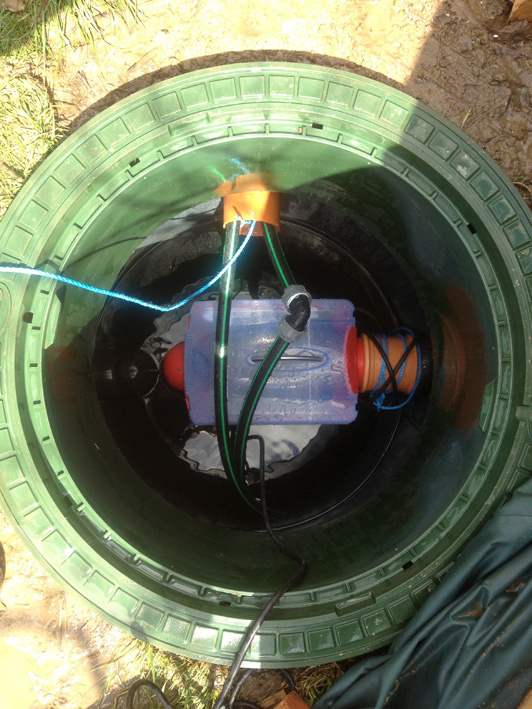 The completed heat-absorber circuit is then pressure tested to 8 Bar to ensure there are no leaks, first with air, then with water. 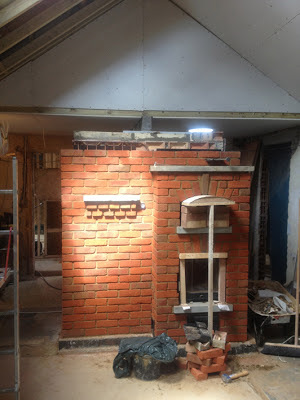 The outer skin begins, using lovely Swanage bricks (local handmade Dorset bricks - same price as other available bricks, nicer, yet local suppliers prefer to stock bricks from many many miles away). 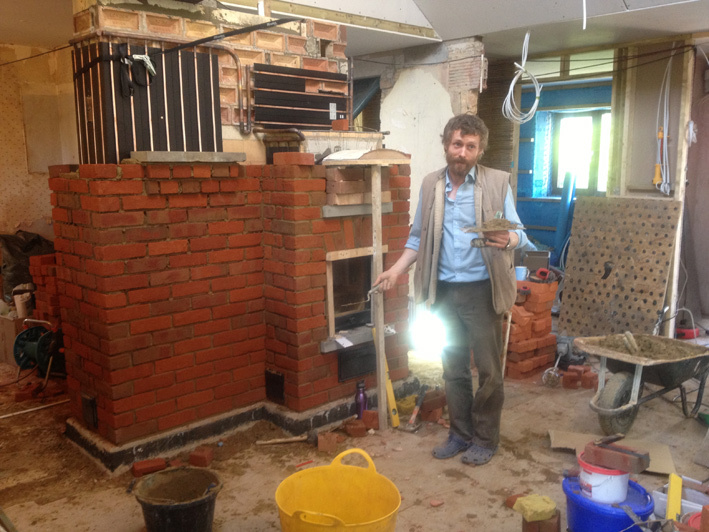 Martin shrugs, pointing trowel in hand. 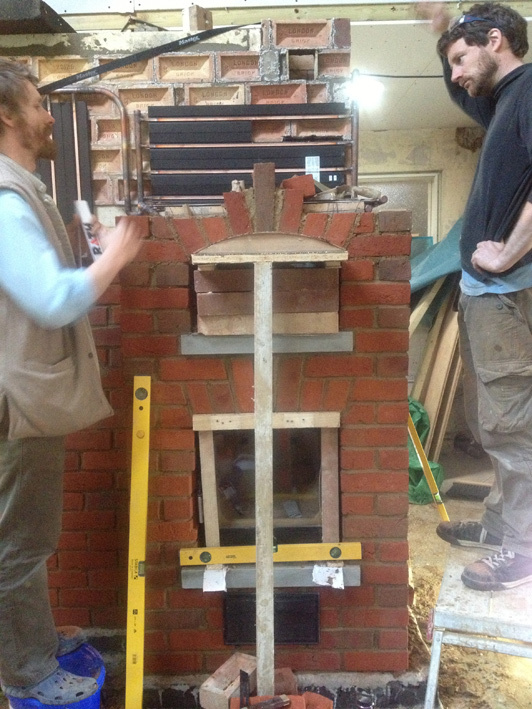 He actually enjoys pointing-up brickwork. This is a rare and wonderful thing. 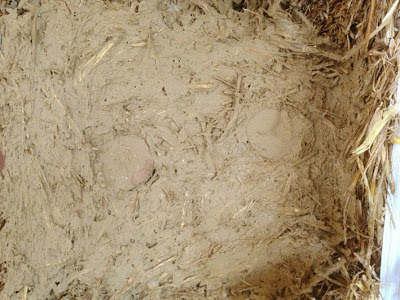 The outer skin is built using clay mortar - clay from the mountain in the garden mixed 3:1 with sharp sand. Cody cuts a brick for the oven door arch. 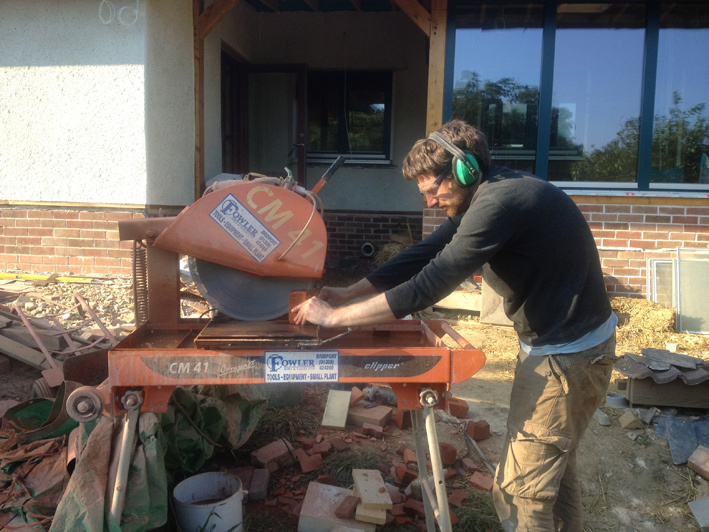 Fowlers tool hire have done quite well out of this build. They are very helpful though. A genuine head-scratching moment. Both arches (flat and curved) in place. Almost finished, apart from the height issue. The core was too close to the timber stud wall and ceiling above, so we had to reduce it in height. Thermometer, showing temperature in first bell. There's another at the base of chimney. 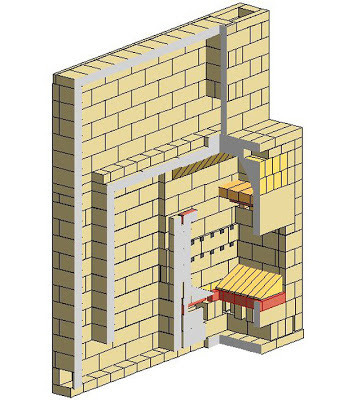 When in use the temperature in the secondary combustion chamber/oven could reach up to 600 degrees Celsius, but the temperature in the chimney shouldn't be more than around 120 degrees, as so much heat will be absorbed by the bricks (and the hot-water system). At this point we ran out of time and the last-man-standing (Cody) had to go home. 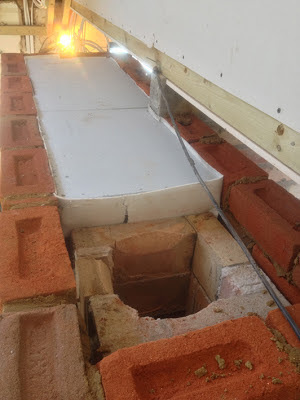 I finished the brickwork fitted the insulation to the top of the stove (three layers of calcium silicate insulation board and a thick layer of clay-mortar). 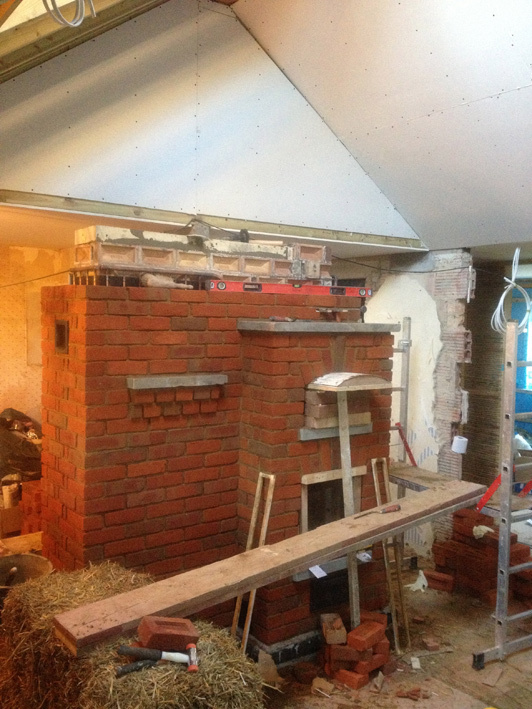 Eventually this will be capped with York sandstone (reclaimed street paving stones, like the top of the main stove) and the twin-wall insulated stainless-steel chimney will be fitted above the flue (nearest the camera). 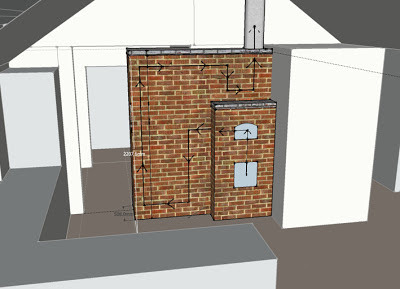 Black arrows show air/flue-gas flow through the stove. The circuitous route ensures as much heat as possible is collected and stored by the bricks. I'm exhausted! It's been one of those phases where suddenly lots of big things are happening at the build and the space is transformed again. 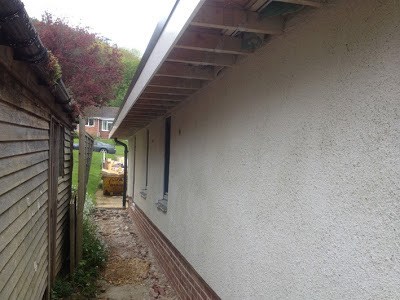 The inside spaces of the bungalow are taking shape and almost all of them now have at least some kind of wall, and are more or less defined as they will be when all is done. 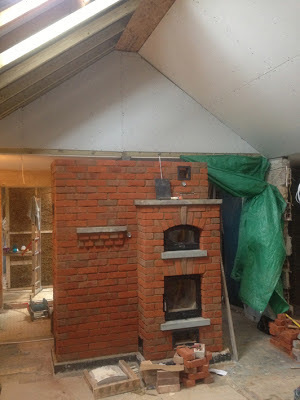 Over a fortnight the big thick strawclay wall went up (the main internal structure in the extension, acting as thermal mass/heat-store and soundproofing between Anna's and my workspaces), as did the also-big masonry stove that will provide us with a highly efficient and lovely source of heat. Each of those is probably a blog by itself, so this one is about the less exciting but still crucial bits that happened before. It's all about the details. Everything. Always. Okay, maybe not actually everything, and not quite always - but a lot of times in life it's the details that define something or lift it from barely passable to something wonderful. It's definitely true of the build. Paying attention to the details of finish should make the home lovely to be in. But before that there's a lot of very mundane details to resolve to ensure the building functions well and efficiently, stays warm and dry, or cool and dry and summer; that things are set up well so that later stages of the build go smoothly, with things fitting together as they should; and that the finished house is easy to live in, move around, and equipment is easy to use with switches located in sensible places (for example). It's been said that sometimes (often?) 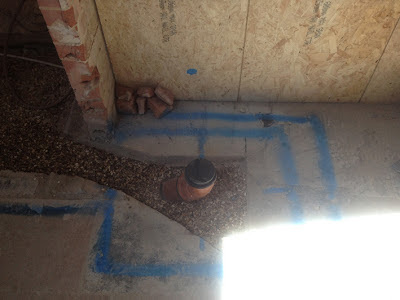 this blog is a load of semi-technical waffle followed by a load of photos of holes. I concede that there is some truth in this! The rest of this blog may fall into that category, although instead of holes it'll be photos of taped-up things, air-sealing grommets, hazel pegs, and cables (and maybe one shallow hole, right near the end). 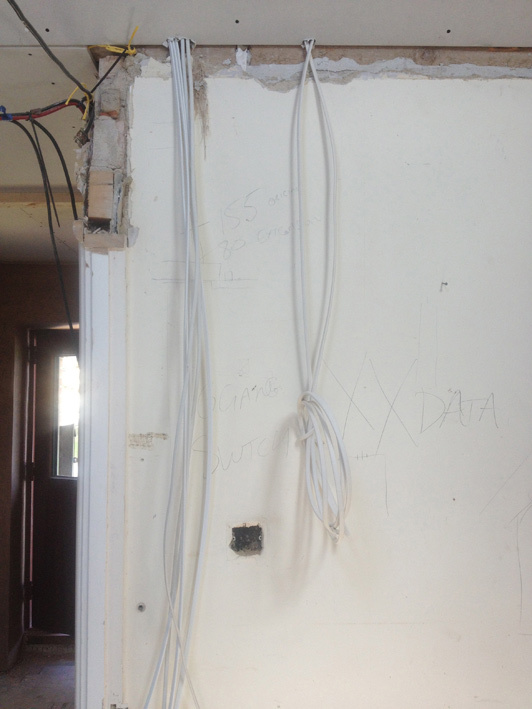 I spent what felt like far too long wondering around the bungalow sealing things up with a variety of different industrial-grade sticky-tapes. 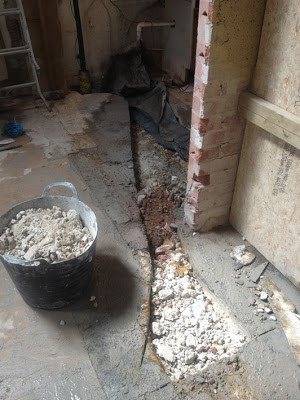 This may well be my least-favourite activity yet, rivalled only by the shovelling and compaction of 33 tonnes of chunky (hard-to-shovel) stone into the foundations in the rain last year. It was necessary to make the building airtight, or as airtight as possible. Airtightness is really really important. 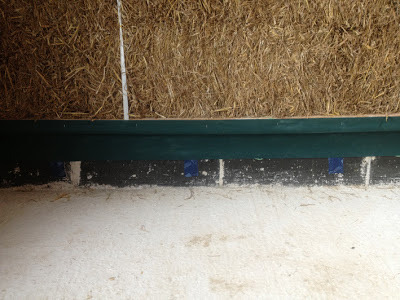 The most wonderfully insulating strawbale walls and deep cosy roof insulation are not much good if there's a big gap between them through which the cold wind blows. Around 20-35% of heat loss from homes is typically through ventilation. 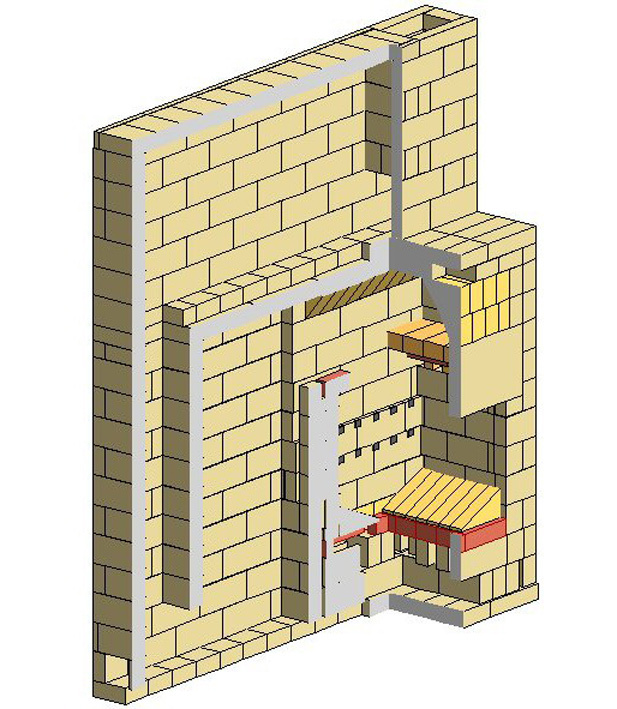 This includes through open windows, doors and airbricks, but also through less obvious means. Draughts around poorly-fitting window and door frames, around cable and pipe entries into the home or through ceilings, even cracks in plasterboard ceilings or masonry walls (Greenspec have a helpful diagram with more info about airtightness and heat loss here) all allow warm air out, and cold air in. 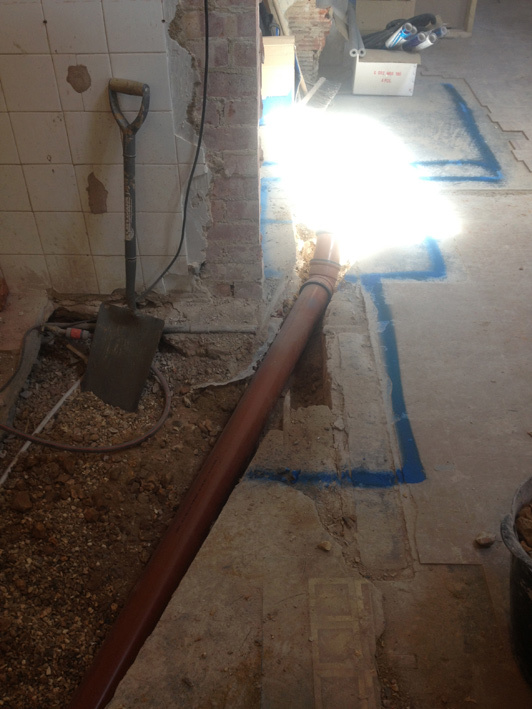 Attention to detail to seal up these points of leakage is essential to create an energy-efficient building. 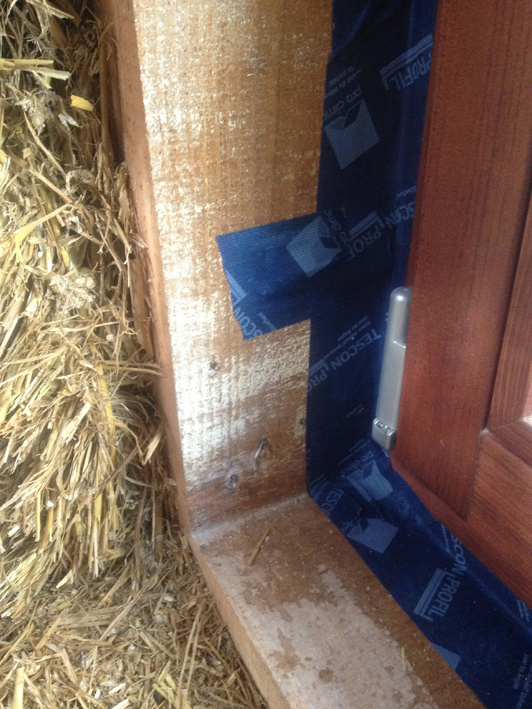 Airtightness does bring it's own problems. 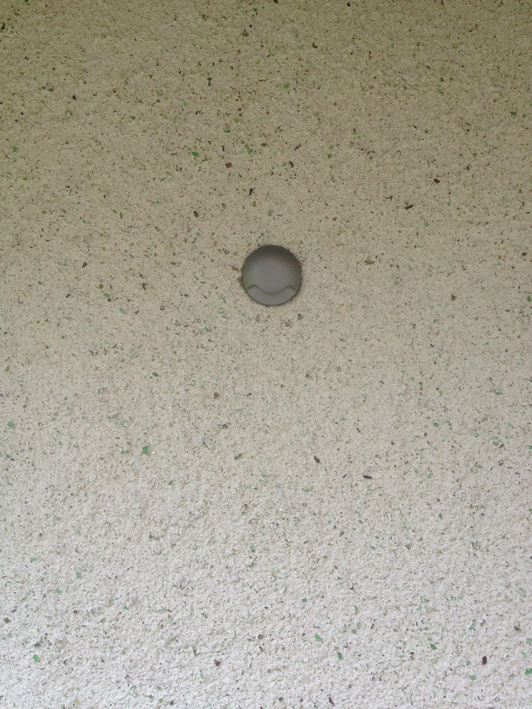 Many of the problems of dampness in buildings stem from moisture in the air condensing on cold surfaces. Ventilation is necessary to remove the damp air from the house. 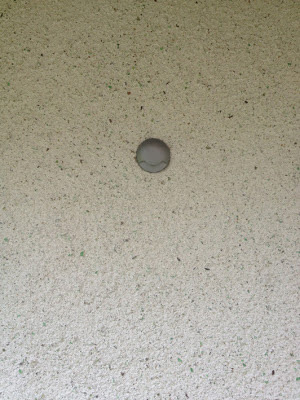 The common way to deal with damp areas is basically to make a hole in the wall (or window frame) and cover it with a grille. This is effective at removing the moisture, it's very simple to do, but is also very effective at removing a large amount of heat. The other problem with airtight homes is a lack of fresh-air and oxygen. 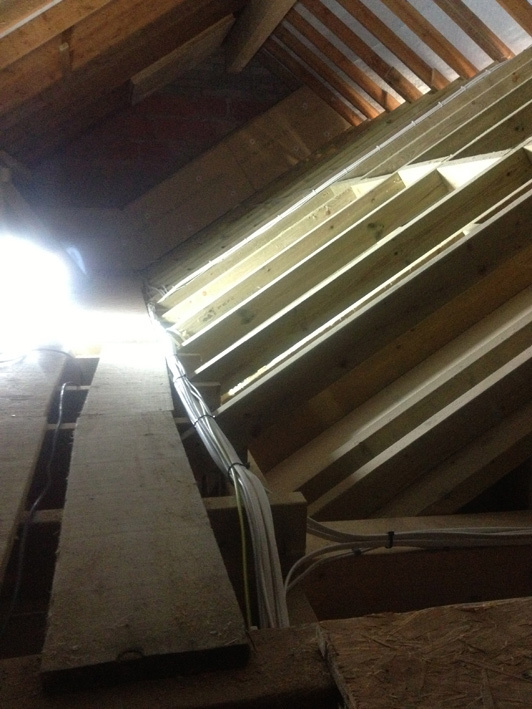 This is all avoided by use of a ventilation system with heat recovery. 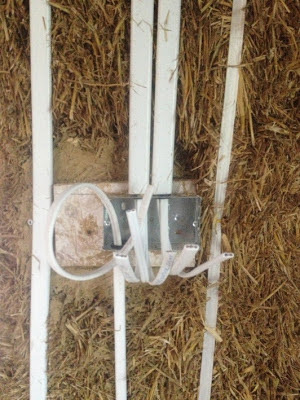 This (unsurprisingly) recovers heat from air being removed from the home and puts it back into the air coming into the home. We have opted for a ducted whole-house Mechanical Ventilation system with Heat Recovery (MVHR). This uses a low-power fan to extract air from the dampest rooms (kitchen, bathroom, anywhere with a sink or a loo, entrance room with wet coats) and supply air to all the other rooms (or sometimes the other end of the same room). The supply air and extract air pass through a heat-exchanger which recovers around 90% of the heat which would otherwise be lost. 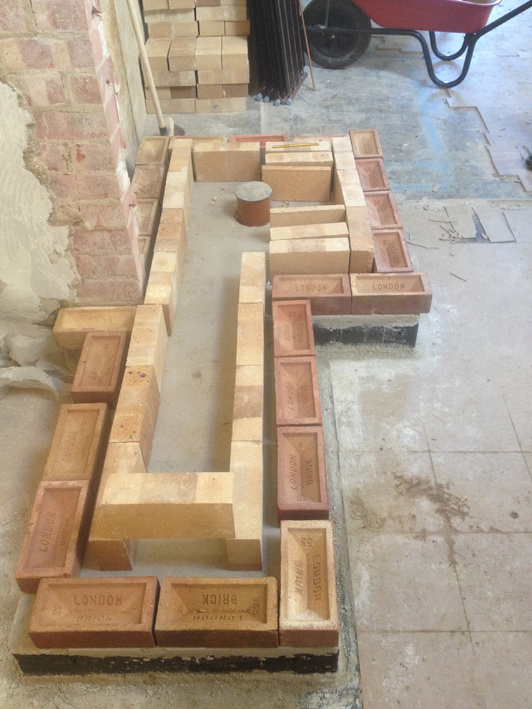 The components of this are now onsite, a worryingly large 3D jigsaw for me to piece together sometime soon. Any kind of combustion heating is a problem with an airtight home. Whether it's a gas boiler or a woodburning stove, it needs air to burn cleanly and safely, without running the risk of carbon monoxide poisoning. 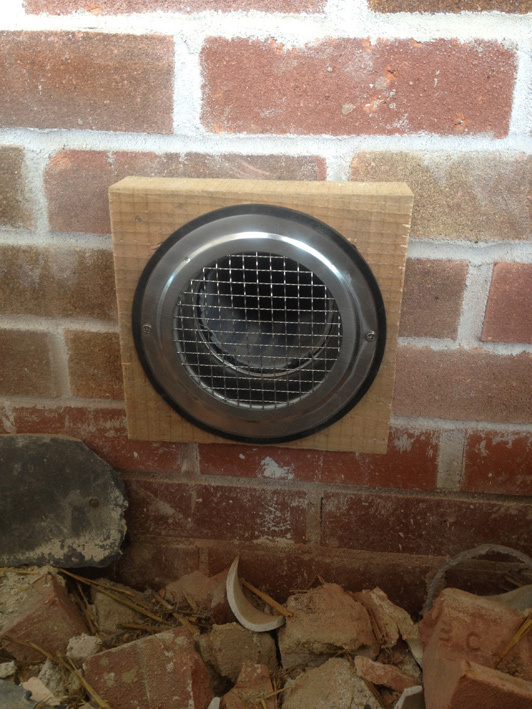 Building regs require a permanently open air vent for a stove in an airtight house. 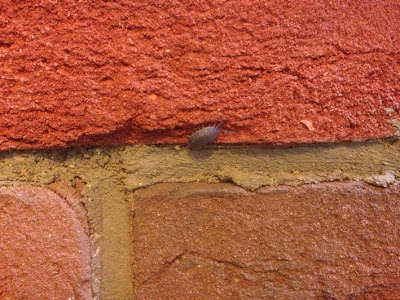 Again, normally this would be a hole in a wall, which renders completely pointless all that painstaking work to thoroughly insulate the building and prevent draughts. 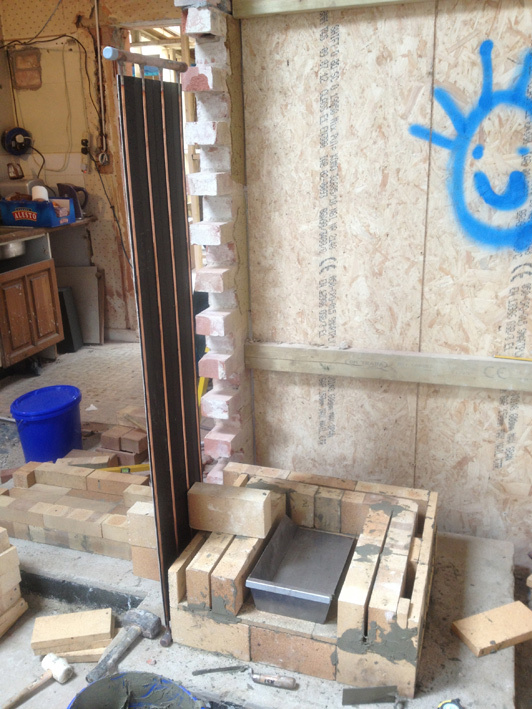 So the stove will have it's own dedicated air-supply, channelled directly into it and separated from the room. The next blog will have more pretty pictures and less explanation. Maybe. No good having a well-sealed window if the frame isn't sealed well to the building. Despite silicone sealant around the frames on the outside I could feel the air blowing through around the frame. The tape eradicated that. 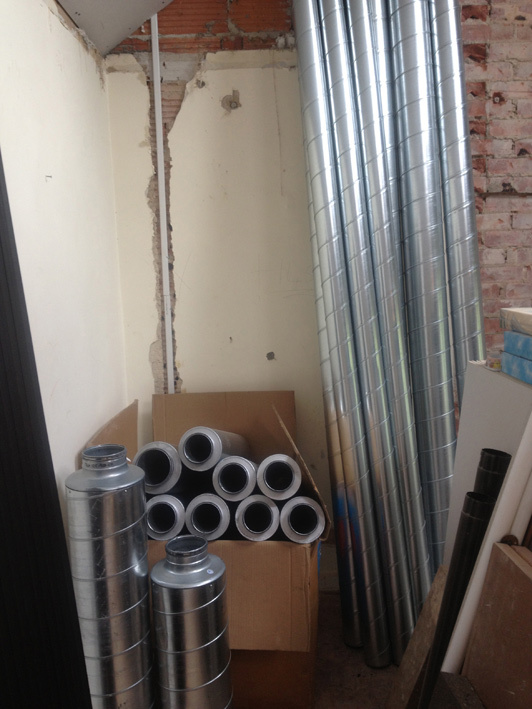 MVHR (heat-recovery ventilation) ducting and fittings, looming at me. Once again, ready for vampire attack. 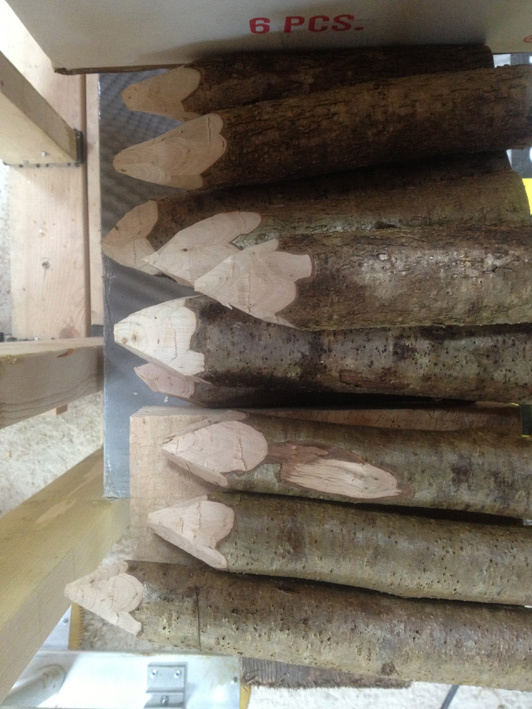 Electric fittings stage 5: Screw smartply OSB offcut to the hazel pins. This allows a bit of flexibility when fitting the switch/socket boxes, meaning they can positioned exactly where needed. Much easier than trying to place the hazel pins perfectly. 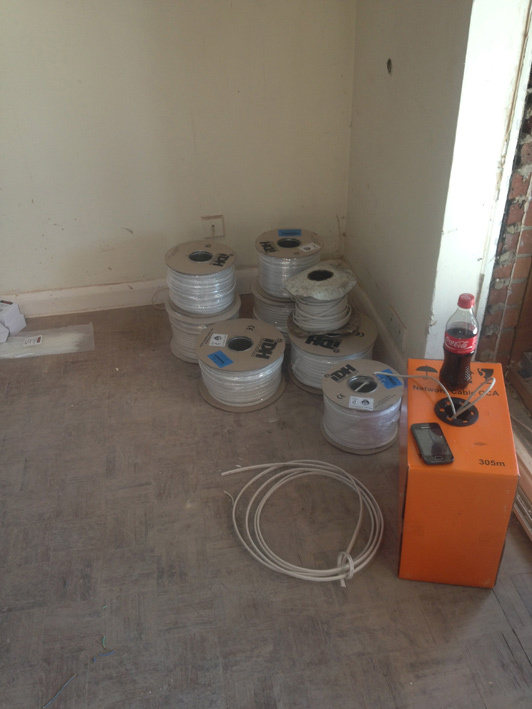 LSF (Low Smoke and Fume) PVC-free cable. PVC is a very polluting material, in production and disposal (http://www.healthybuilding.net/pvc/ThorntonPVCSummary.html), responsible for chlorine and dioxin release. It also releases highly toxic fumes in the unlucky event of a fire. 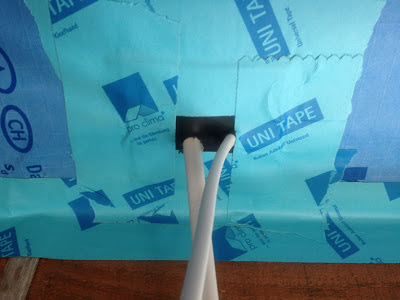 PVC-free cable is also tougher, which is an added bonus. Justin the electrician hasn't totalled up the distance yet but we think there's around 2 km of cable in the building now, for sockets, lighting and switching, and data. Shocking how quickly it adds up. Home-made airtightness grommet (EPDM rubber-roofing offcut) where cables come through recycled-paper airtightness membrane in the ceiling. Very discrete external LED light fittings they are too. 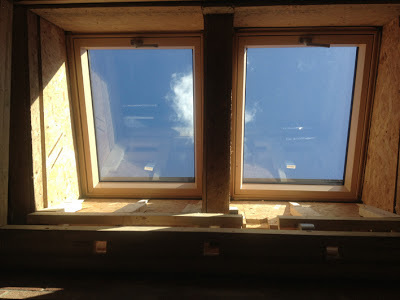 Boxing for an MVHR duct, under sunny windows. I'm really liking the sun this year. 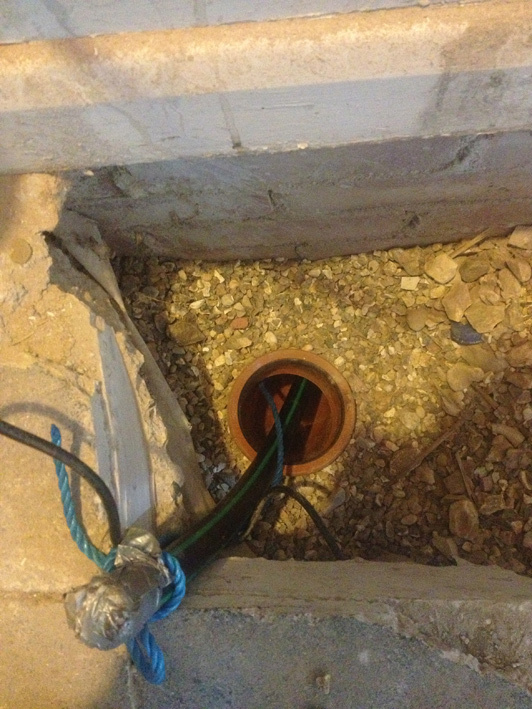 One of those "doesn't look much but feels momentous" moments - waterpipe finally persuaded to get around some awkward bends in the service duct linking the outside rainwater harvesting tank with the house. Ta-da! One pipe supplies rainwater to the header-tank in the loft, the other will dump it back into the underground tank if we go away (the water will go stagnant in the warmer loft but will stay clear and nice in the cool, dark underground tank). 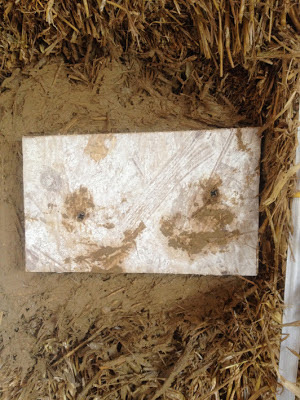 An opened up bale demonstrating the behaviour of water and rot if you get a leak through bales (in this case via rubbish tarpaulin covering spare bales throughout the wettest year on record in England). 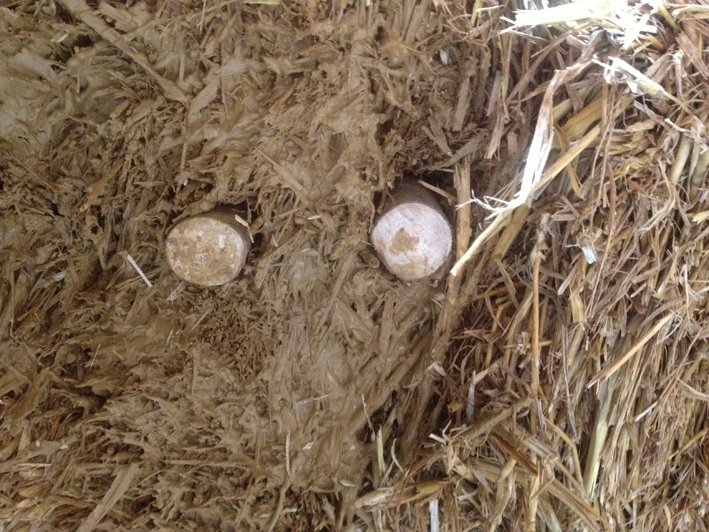 The water drains straight through the straw, and only the area immediately below the leak rots. 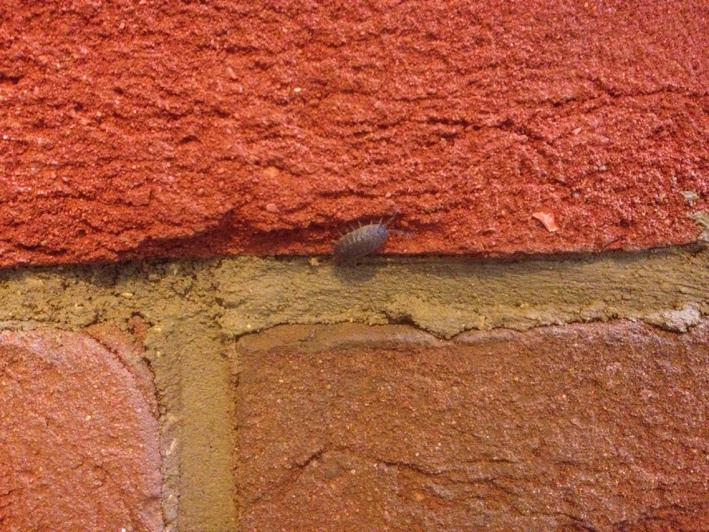 If this happens in a wall the rot can be cut out and new straw stuffed in. 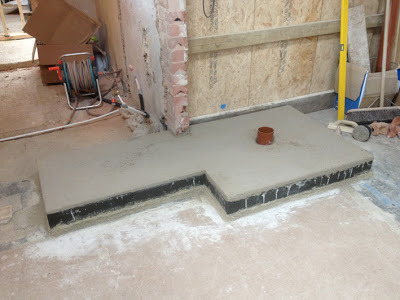 Floor repaired, insulating (and strong, and recycled) foamglas slab fitted, with NHL lime screed on top, air pipe in centre, ready for stove. Finally, a footnote about electric cables and strawbale walls. Despite the beliefs of almost any electrician, and even a few green-builders, you do not need to use armoured cable in strawbale walls! 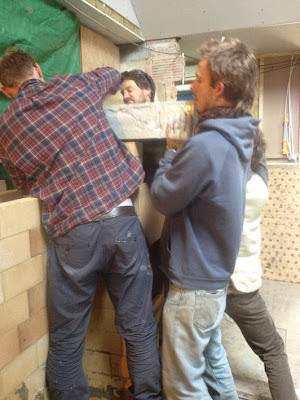 This idea seems to have spread via Grand Designs and Ben Law's otherwise amazing build in Sussex. 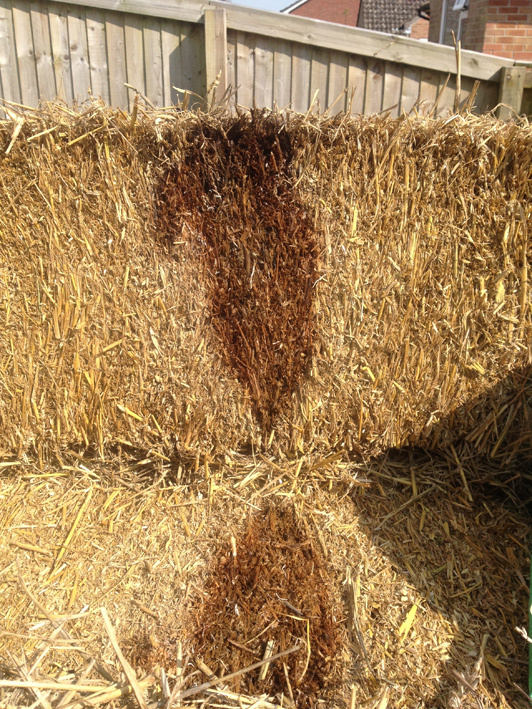 The idea is that mice or other animals might like to live in the straw, then might nibble through the cable-covering, then an electric spark might trigger an almighty, home-destroying blaze. There are a couple false assumptions here. 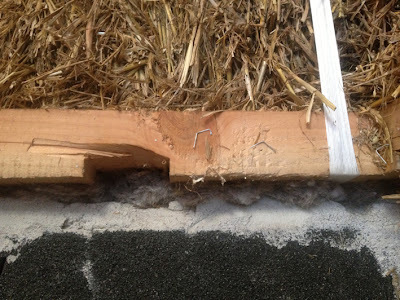 Firstly the mice: they probably would like to make a bed in straw, but are equally - if not more - likely to nest in any loose insulation materials, such as are commonly used in walls and ceilings through which cables often run. If the bale walls are built properly there is nowhere for mice to get into the bales. 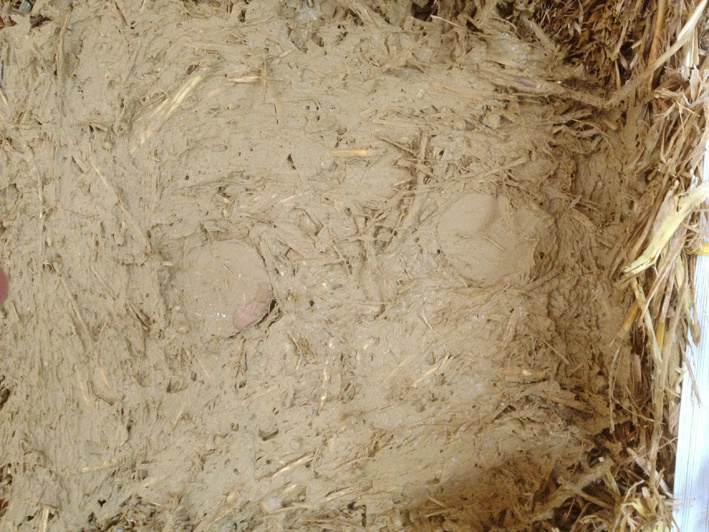 The bales are dense, compressed and compacted, and completely covered in plaster or render. 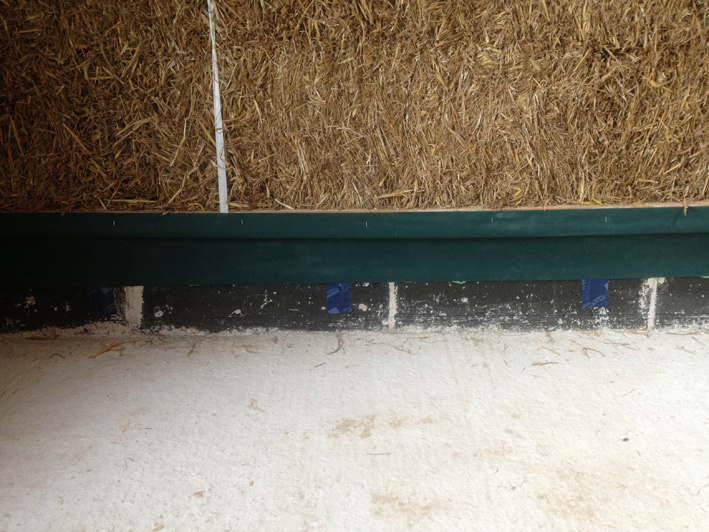 Secondly the fire risk: strawbale walls have been tested and found to exceed the bulding regs requirements for fire resistance many times, withstanding fire for 2 hours 40 minutes before a fail (smoke penetration from one side to the other - still not a fire). 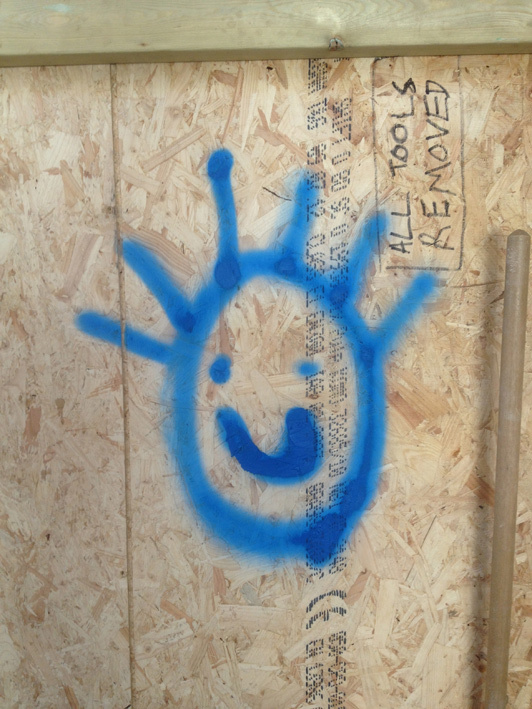 Strawbale construction has been approved for bushfire areas of Australia (pdf link). 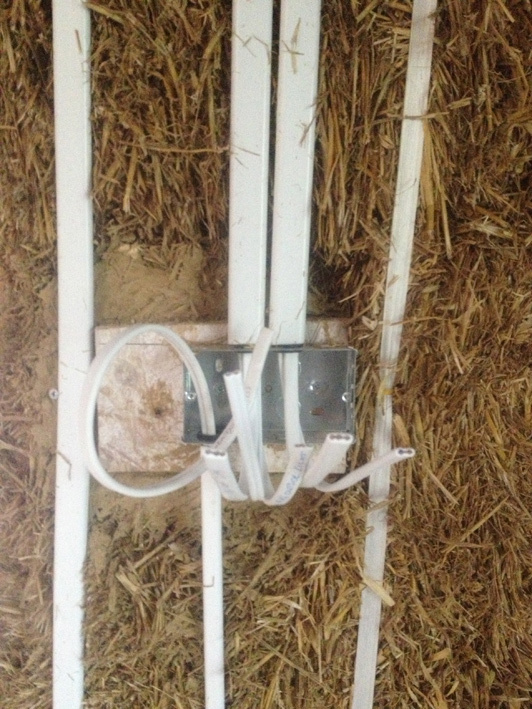 In any case, the cables are run on the surface of the straw wall in conduit which is then completely encased in clay-plaster. I'm sure I'll return to the subject of strawbale and the perceived fire risk - it's a myth that needs some serious busting!